Non-vegetarians who in fact are perhaps viewed as the “default setting” in eating preferences often criticize vegetarian dishes for lacking the kind of nutritional substance provided by any kind of meat really. If I wasn’t on the other side of the fence (the side of the chefs, not necessarily the side of the non-meat eaters) then I probably would have tended to agree with this view, but I do indeed know better and can map out an entire vegetarian eating plan which even meat-lovers will find hard to fault by way of its nutritional value. 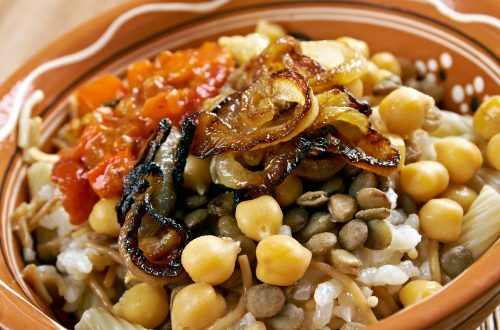 For now though I’m just going to discuss a recipe for one specific vegetarian dish in the form of Koshary which is a popular Egyptian working class meal mostly enjoyed at lunch time or for late lunch / early dinner. Fundamentally the dish is comprised out of a base of all manner of pastas you can put together really, with a bit of rice as well. So you might be able to identify a long strip of spaghetti here and there, snaking out of very shortly cut fettuccini pasta as well as linguine pasta, all of which pasta perhaps tastes exactly the same but is added into the dish for presentation. It could also be a case of the “working class” element to the meal coming into effect in that this is pasta which was traditionally leftover from the previous night’s fine dining ingredients. Anyway, as mentioned, the pasta base is completed with short rice. Then comes the toppings which include lentils, usually the brown or black variety, or both, a cooked tomato sauce with very visible tomato bits cut into cubes and then the variations to the dish come into effect with the remainder of the ingredients making up the topping. That’s about as basic as a koshary dish can get, apart from maybe the addition of chickpeas as well, otherwise a more elaborate koshary dish variation will also include ingredients such as deliciously fried onion rings or strips, salted for taste and fried in vegetable oil separately from all other ingredients. The cooked tomato sauce can have its flavor enhanced with the inclusion of a tomato paste during preparation and sometimes cloves are added to the sauce itself or just added in to the overall dish after being cooked separately. Of course you simply have to have the dakka, which pretty much makes the meal by giving it a serious kick. It may be served on the side as a dressing of sorts which is optional, but you’d at least be expected to pour some of it onto the meal if you want to limit the spicy punch it packs. This dressing is typically made with vinegar, spices, raw minced garlic and chilli and once again, this pretty much makes the koshary experience. If you’ve ever had to prepare koshary as the cook then you appreciate it so much more when it’s prepared for you by someone else, because it takes a lot of effort to prepare everything. It is a very heavy dish too and I personally feel a bit sleepy after eating it, so I don’t know how workers can continue working after this heavy lunch.